On September 7, 1900, a hurricane quietly entered the Gulf of Mexico. By the next day, this storm brought in winds of 150 mph, which hit the Galveston barrier island destroying the town of the same name. This hurricane known as The Great Storm is the deadliest * natural disaster to hit American soil. 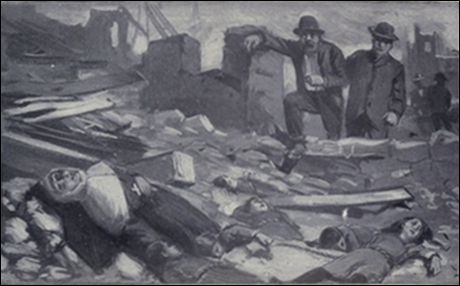 3,600 homes were destroyed, and more than 10,000 men, women, and children lost their lives. * Historians consider it worse than Katrina because of the number of fatalities. 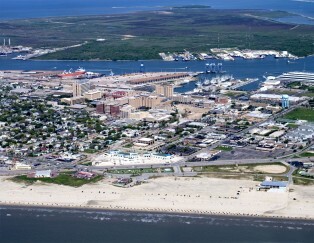 At this time, Galveston, a bustling port town was one of the largest and wealthiest cities in Texas. The future was bright for its 36,000 residents. After 9:00 p.m. on September 8th all this prosperity would be gone. 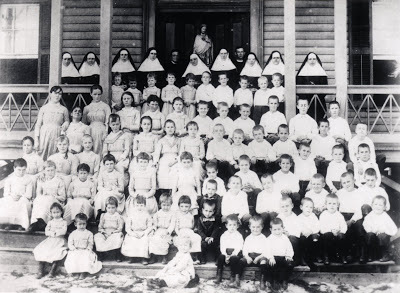 Among the dead where 10 nuns and 90 of 93 children at St. Mary’s Orphan Asylum located on beachfront property situated outside the town. St. May's Orphan Asylum--building on right girl's dorm. These nuns were apart of the Sisters of Charity that had established a Catholic infirmary in Galveston. The orphans under their charge were mostly children that lost their parents to Yellow Fever—so eventually the orphanage connected to the hospital was moved outside of town to avoid this disease. Sister Elizabeth Ryan was in Galveston on the morning the hurricane hit collecting supplies. Mother Gabriel tried to convince her to stay at the hospital until the storm passed but she refused for her supplies included food for that day’s supper at the orphanage. What Sister Elizabeth didn’t know is that there would be no more suppers at St. Mary’s. During the afternoon the winds and rains increased, the tide rose higher, waves crashed onto the beach sending floodwaters ashore. 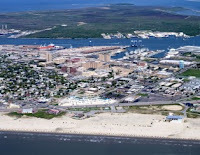 St. Mary’s consisted of two large dormitories with balconies that faced the gulf. Both buildings sat behind a row of sand dunes that were supported by Salt Cedar trees. When the floodwaters reached the dorms, the nuns gathered all the children into the girl’s dormitory for it was newer and the stronger of the two buildings. At first, they stayed in the first-floor chapel, the nuns had the boys and girls sing a French hymn Queen of the Waves, which fishermen sang during storms—to keep the group calm. Nuns and children at St. Mary's. But as the water rose they moved the group to the second floor where each nun tied clotheslines to their waist and then attached 6 to 8 orphans to them with it. Several of the older boys went up to the roof. The children terrified now watched as the boy’s dorm was lifted off its foundations and washed away. A ship that was being tossed in the storm hit their dorm--it lifted their building up, the floor fell out from beneath their feet, and the roof crashed down trapping them in the water. Only 3 orphan boys survived, William Murney, Frank Madera, and Albert Campbell. These two boys were carried away by the water, and both later woke in a tree. They clung to this tree for a day before a small boat from town rescued them. Several of the nun’s bodies were found later with children still attached via the clotheslines. 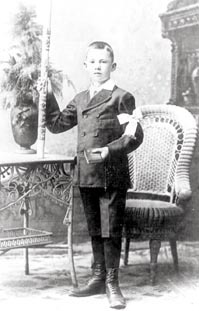 One of the surviving boys witnessed a nun reassure two small children, “I will never let go.” She was found with both children still firmly grasped within her arms. The nuns and children were buried where they were found. 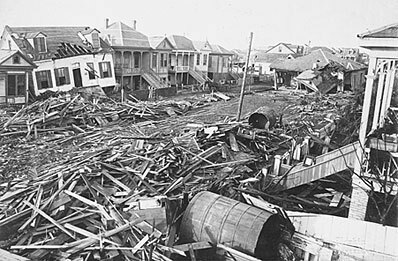 On this terrible day, when the wind and gulf waters met at 6:00 p.m. the town was flooded—whole blocks were washed away within minutes. At 7:30 p.m., a tidal wave struck the south shore, it reached 15 to 20 feet. 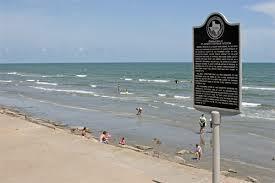 In 1994, on the anniversary of The Great Storm Texas placed a historical marker at the section of the seawall, built after the storm, where St. Mary’s once stood. Descendants of the survivors attended, and an all sang, Queen of the Waves. Today, many believe that the spirits of small orphan victims haunt two structures where St. Mary’s once stood. 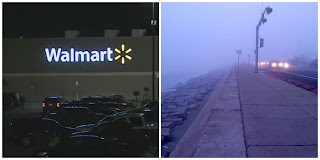 Employees at the Seawall Walmart have reported: misplaced toys, missing pallets of toy inventory, phantom children’s laughter and cries for help. One former employee recalls the time she heard a little girl calling for her mother. She went to find the lost child to help. She searched the toy department calling out but received no response. Other’s hearing this child’s cries, both employees and customers joined in the search but the child was never found, the sobs eventually stopped. 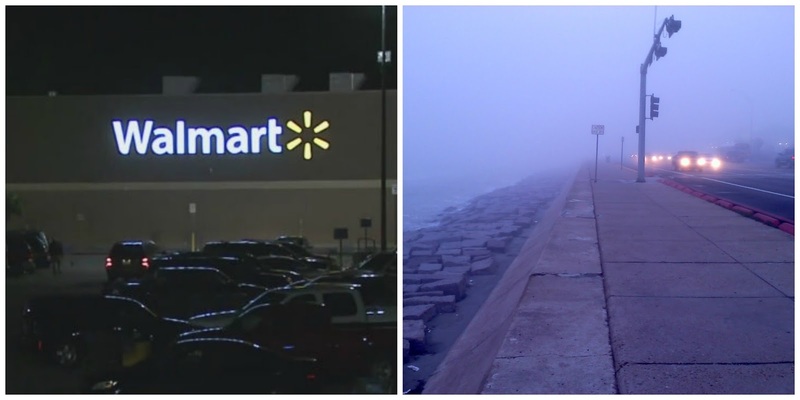 Ten years ago this store was considered the most haunted spot on the island. Several news stories highlighted it. 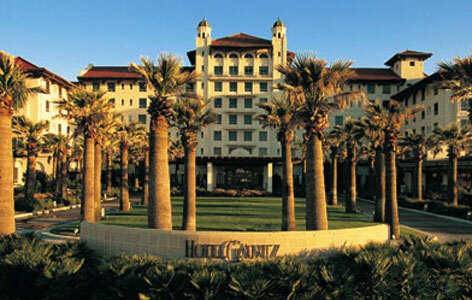 The Hotel Galvez was built, in 1911 on the beach where St. Mary’s once stood. This hotel known as Queen of the Gulf has hosted U.S. presidents and celebrities as well as the ghosts of several small children. 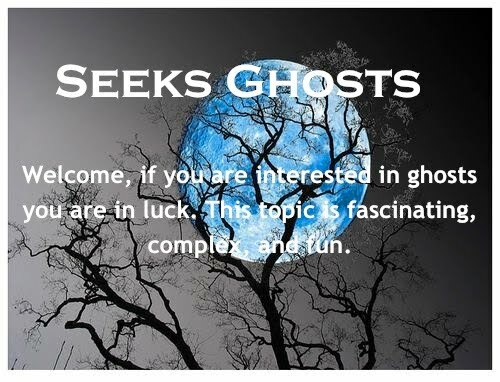 Over the years many guests have reported poltergeist activity including doors opening and closing and lights turning on and off by themselves. Several witnesses have seen glimpses of the orphans that linger. Today, Galvestonians often see a figure dressed in an old-fashioned nun’s habit walking along the shore. Here is a local news report about the anniversary, the storm and St. Mary’s. The following video shows Galveston before and after this Category 4 hurricane.